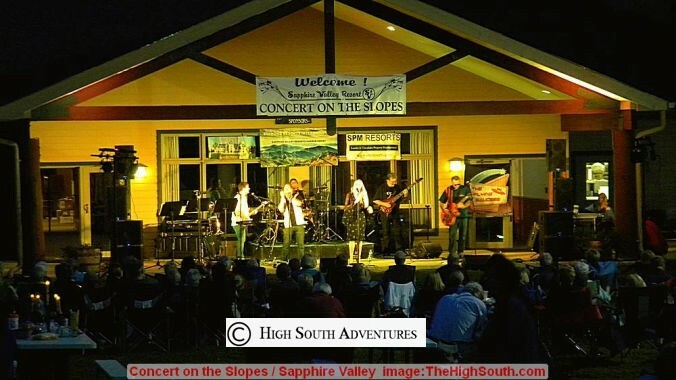 2019 Concert on the Slopes! Reserve a Tent and Table! SUMMER CONCERT TICKETS are now available at the Community Center! SCROLL DOWN FOR MORE INFO AND VIDEOS!! 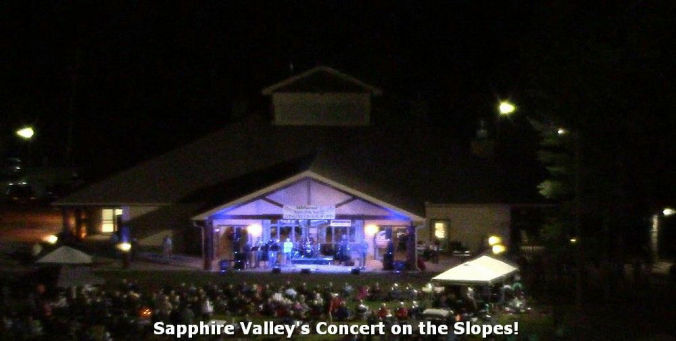 Sapphire Valley Resort’s Concerts on the Slopes offer a real value and experience for your mountain vacation memories. 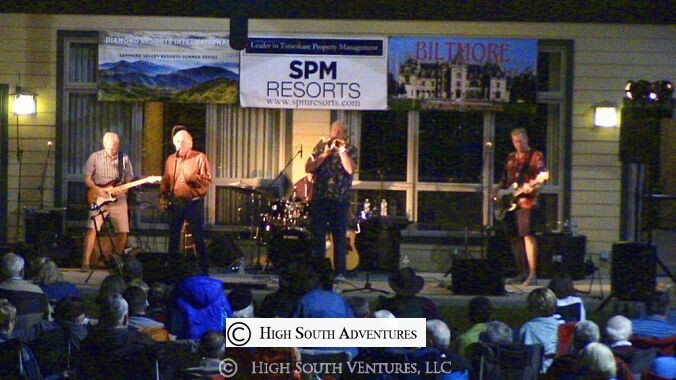 Top notch entertainers perform on the back porch of the Resort’s Community Center as we all relax in chairs and golf carts (yes – this is a drive in concert too!). Bring food, beverage and friends for a great time under the stars on the base of Ski Sapphire Valley. Open to the Public - The ticket price for each show is $20 if you purchase your ticket before the day of the show, and $25 on the day of the show and at the gate. Your Own Table and Tent! Also included is a 'Buy One, Get One Free" offer for The Vordach! Sapphire Valley's own Zip Line Experience. We can also supply a personal, reserved table and tent with early reservations! Call 828-743-7663 for more information and tickets. Tickets are available at the Sapphire Valley Community Center, individual shows, Adult and Child tickets, or you can purchase a SEASON PASS for even greater savings. You can even reserve an entire tent with tables and chairs for the whole gang! 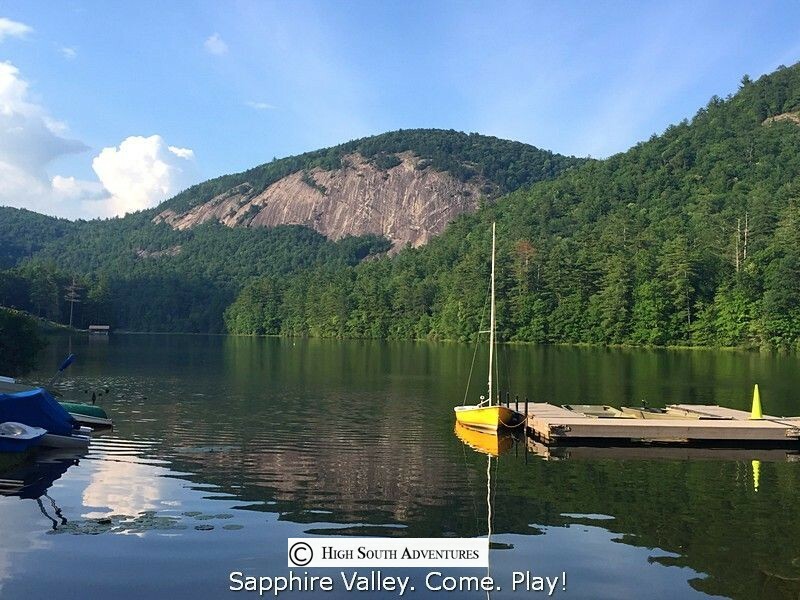 ​Sapphire Valley Resort provides approximately 100 chairs available on a first come, first served basis. You are encouraged to bring your own chairs/blankets. Bring your coolers and pick-nick baskets and enjoy! “We had Dashboard Blue play during our neighborhood concert series and they blew the crowd away. Out of four bands this was everyone’s favorite. Their song list had something for every generation." Tradition is defined as “The handing down of a belief, legend, or custom from generation to generation”. The Swingin’ Medallions, a 51-year Southern tradition, are a living definition of the word. How does a band endure the generations? The group’s signature high-energy style delights audiences of all ages. THE TAMS have been entertaining and thrilling audiences for over 50 years! Known for such hits as "Be Young, Be Foolish, Be Happy", "What Kind of Fool", "I've Been Hurt" and "Untie Me #12 on the R&B Charts", The Tams have had Several Gold Records, and 1 Platinum Single. Though their style of music has historically been referred to as Beach Music which they have had many Beach Music hits, it can be also classified as a mixture of Smooth Soul, and R&B. Their show is fun, fresh and exciting and appeals to audiences of all ages and musical tastes. Don't look any further as the Motowners take you on a walk down town with the sounds of Motown and classics by Sam Cooke, Wilson Pickett, other classics from the 60's and 70's. Tuesday, July 17 – 7:00 p.m.
Song clips to exemplify the variety of music in the Tuxedo Junction band repertoire.